Recently I’ve started saying that it is becoming impossible to explain well what I do: I’ve become a #slashie, or possibly a serial entrepreneur. The three (major) things that are demanding my attention these last few months are very diverse, and from a distance seem to be unconnected. But, the good news: the more I work on these different things, the clearer it is that they are in fact connected. http://www.machi-consulting.nl/wp-content/uploads/2016/05/plastic-addiction.jpg 680 1024 admin http://www.machi-consulting.nl/wp-content/uploads/2013/04/MAC-logo.jpg admin2016-05-31 23:06:402016-05-31 23:09:05Plastics: are we addicted? http://www.machi-consulting.nl/wp-content/uploads/2016/05/business-in-Myanmar_Guillén-Pérez.jpg 427 640 admin http://www.machi-consulting.nl/wp-content/uploads/2013/04/MAC-logo.jpg admin2016-05-02 14:35:252016-05-02 14:49:04Bringing your business to Myanmar? Today, October 25, the state visit to China of the Dutch King and Queen officially started. In the run-up to this state visit, the discussion on whether or not the King and Queen should talk about human rights in China in their meetings with Chinese counterparts intensified again. This is a regular recurrence ahead of any high-level event between the Netherlands and China. It is also not unique to the Netherlands. I have read similar discussions in the past week while President Xi visited the United Kingdom. As usual, the state visit is accompanied by a large trade delegation. And sometimes the question about human rights in China also gets asked of Dutch entrepreneurs: Do you talk about human rights when doing business in China? The answer often is: We’ll leave that to the politicians. At first glance, this makes sense. For example, when talking about the Chinese government’s attitude to human rights’ defenders, which is often part of this discussion. How can a Dutch business do anything about this? Let business people focus on running their business. What is forgotten here is that human rights are many more than only the rights referred to in the above context, such as freedom of expression. The Universal Declaration of Human Rights also includes others such as freedom from slavery, the right to a fair wage and the right to join a trade union, to name a few. These are the type of rights that should have the attention of business. After all, business has an impact on what people earn, under what conditions people work and on the environment (clean or polluted) people live in. This gives businesses a responsibility to respect these rights and to ensure that their business operations do not have a negative impact on them (on the rights of employees, but also on the rights of people living near a factory, for example). The United Nations Guiding Principles on Business and Human Rights are the framework that outlines this responsibility. The Guiding Principles are also integrated in international standards such as the OECD Guidelines. These Guidelines are the foundation of policies on international corporate social responsibility as developed by the Dutch government: Dutch companies are expected to follow these Guidelines in their international operations. In some countries the discussion on business and human rights has already led to legislation: this year, anti-slavery legislation came into effect in the UK and as of this month, as part of this law, large corporations are required to report on the steps they have taken to ensure slavery does not exist in their supply chain. Over the last decades, China has achieved remarkable progress on eradicating poverty. This is a commendable achievement but unfortunately not all problems are yet solved. Regularly, multinationals headline international media with news on unsafe labour conditions or on toxic materials used on their production locations in China. International supply chains are often long, complex and non-transparent: it is difficult to know everything that occurs in the many links that connect that supply chain. But by not knowing, a company exposes itself to a lot of risk. It is not all bad news. In addition to the ethical argument that a modern business should take responsibility for the societal impact of its business operations (aside from only financial impact), companies increasingly show that it can be good for a company to do so. In-depth knowledge of what happens in your supply chain and executing due diligence, ensures that a company can act faster on issues that might otherwise only show after causing a problem. This means that a company can manage its supply chain risks better and can prevent unnecessary disruptions to production. Transparency about a company’s policy on human rights and CSR increases access to finance, from banks or investors but also when applying for funding from the Dutch government (which requires following the abovementioned OECD Guidelines). That transparency also leads to increased trust from clients: when supplying business clients it means that you are also reducing risk for them. But also consumers are increasingly asking questions about where and how products are being manufactured. Being able to provide answers to those questions can give you access to a loyal new group of customers. How does your business work on human rights in China? Taking the above perspective, it almost seems strange that companies who do business in China (or any other country) don’t get that question more often. Within their value chain, this is something a company has influence on: human rights are not only relevant to politicians but also to business. Positively using that influence, sets a company apart from its competition and makes it better positioned for future business success. Does this sound complicated? That first step is easier to take than you might think: take a good look at your business operations and your (international) supply chain and use that as your starting point. Knowing your supply chain and identifying the main risks is key. Go from there for your next step. Are you wondering if you should even be active on the Chinese market because of the government’s human rights track record? Then also consider that even if you cannot influence government policy, you can make a positive impact through your own activities and your supply chain. The travel virus caught me early: I left for Hobart, Australia for a year when I was 16. Living there, I discovered how much bigger the world was than the small village I grew up in in the Eastern part of Groningen in the Netherlands – even if my life there already gave me a relatively wide view of the world. Since then, I lived in Haenosaki (a small village in Nagasaki-prefecture in Japan), in Osaka, in Tokyo. I’ve travelled, mostly in Europe and Asia, seeing some unique and fascinating parts of this world. In which city do you want to temporarily live and work? At that time I was looking for somewhere in China. I chose Shanghai. It was the first question Molly Turner, Director of Public Policy and Civic Partnerships at Airbnb, started her presentation with but the answer seemingly surprised also herself: only a few hands were raised in the audience, consisting of several hundred people. Undisturbed, she went on to talk about Airbnb and how it fits with the idea of a smart city – the overall theme of the conference I attended earlier this month. Her talk brought into the conference a theme which I felt lacking up until then: people. You can have all the high-tech applications available used in an urban infrastructure, but without people you have no city. http://www.machi-consulting.nl/wp-content/uploads/2013/04/MAC-logo.jpg 0 0 admin http://www.machi-consulting.nl/wp-content/uploads/2013/04/MAC-logo.jpg admin2015-06-21 20:39:382016-04-30 14:08:28What makes a city smart? Sunday. I’m spending my afternoon in the sun at the beach. 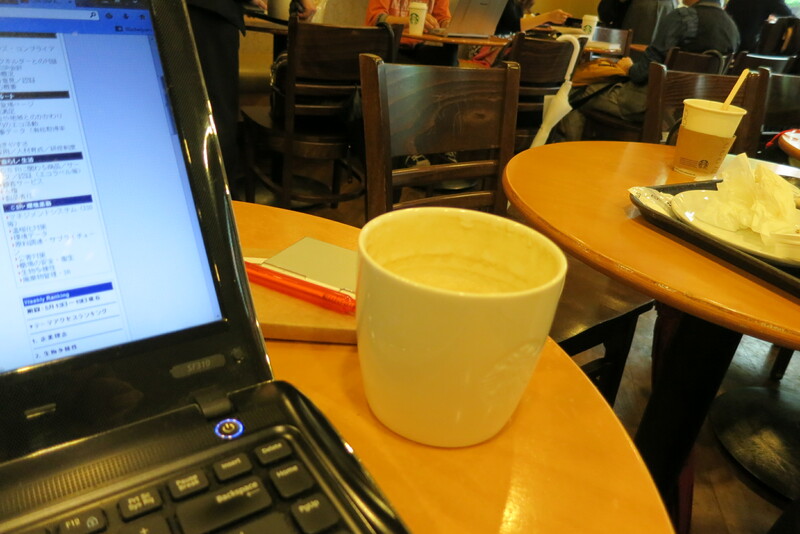 Still doing a little work – I’m reading a recent publication on CSR in China to review. But I’m also looking back at the past week with a few highlights below. I’ve been busy, and the past week is a good example of what I am currently spending some of my time on. What does the world think about China? This question was a large part of my Thursday last week. Listening to Ingrid d’Hooghe‘s talk about what China is doing to improve its international image, I was reminded of a coffee meeting earlier that day. At one point during that conversation with a new acquaintance who moved from Hong Kong to the Netherlands a year ago, she mentioned: “Actually, I don’t feel that proud anymore to be Chinese.” It was an interesting comment and I asked her why that was. Unsurprisingly, moving away from your hometown or country means that you gain a different perspective on the place you come from. Seeing from a distance what is happening in China – on topics such as pollution, business, democracy, censorship – made her feel less positive about her country’s future. The man next to me – dressed in jeans and jacket – said last week, as we were observing the group of people that we were part of. We had both just walked in to a lunch networking event, and were surrounded by – mostly – (older) men in suit and tie. I was not surprised: I knew the organization, the event was hosted in the board room of an international bank and I had dressed accordingly – adding a little of my own style to business formality. You know that feeling when you are really excited about something but then… nothing? That’s kind of how I left Tuesday’s ‘A special night with Naomi Klein’, one of the events at this year’s IDFA festival and hosted by the John Adams Institute. I had been looking forward to this evening since I heard about it through a friend as it would focus on her latest book This Changes Everything on the link between climate change and capitalism. http://www.machi-consulting.nl/wp-content/uploads/2013/04/MAC-logo.jpg 0 0 admin http://www.machi-consulting.nl/wp-content/uploads/2013/04/MAC-logo.jpg admin2014-11-26 00:56:232016-05-18 12:21:04This changes everything? Last Friday saw the opening of the newest addition to the Dutch diplomatic and economic network in China: the Consulate-General in Chongqing was opened by the current Dutch ambassador to China, Mr. Aart Jacobi, and the vice-mayor of Chongqing. I had a sneak peek in the office just the week before: looking out across Chongqing from the 52nd Floor of the Yingli International Financial Center was a pretty impressive sight. The CG’s main task is economic diplomacy: supporting Dutch companies interested in expanding their market to not only Chongqing but also to Sichuan or Shaanxi which the Consulate is also formally responsible for. If you follow news on China even a little bit in the international media, you will have heard about the high levels of air pollution in pretty much all major Chinese cities. Airpocalypses even: when the level of pollution in a particular city gets so high that public life comes to a halt. Beijing experienced this on January 12, 2013 (to name the most extreme day) when the level of PM2.5 particles in the air (the main pollutant, and what is generally measured to assess the level of pollution at any given moment) reached a staggering 755. 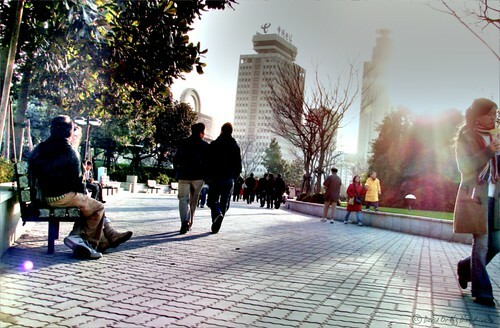 In Shanghai, the record stands close to 500, occurring on December 6, 2013. To put these numbers into perspective: the WHO recommends a level of 25 (of PM2.5) as the maximum level for clean air. I walk from the crowded main route across the temple complex through an open door on my right. 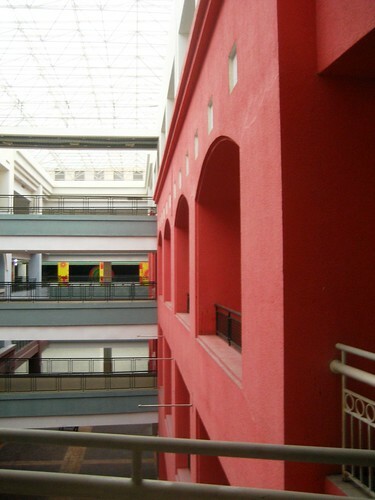 I wonder if visitors are supposed to be here, the corridor I walk through is deserted – and not yet ready for tourists it seems: the dried dusty-red paint on the walls is slowly coming off. At the other end I walk out into another small inner square, lined by a white wall and with another temple hall. The noise of the crowds on the other side has fallen away. I am alone, apart from a woman who is sweeping the square with an old-fashioned broom made of twigs. Swish. Swish. Swish. Swish. The pattern of sound becomes almost the only thing I can hear. Beyond the regular sweeps there are some birds singing. Beyond that, some soft Chinese chatter of people on the other side of the hall. I walk around the building to yet another corridor leading to yet another square surrounded by buildings in the style of this temple. Again, I feel as if I’m not supposed to be here – when I spot one or two others who clearly aren’t part of the scene in front of me I walk on. Here, I discover the source of the chatter I heard on the other side. In front of me, on the steps leading to one of the buildings are two monks, quietly chatting away. They are watching a game of table tennis that is happening in the middle of the square. Two more monks are playing against each other. The game looks friendly and relaxed, with laughter and short conversations between them and the third man standing next to them watching them play. Another temple: a nunnery. I walk in cautiously, and as I come closer to the main temple hall I hear the sound of nuns chanting. Walking closer, I realize there is a ceremony happening in the temple: the hall is filled with at least 40 women in their traditional yellow Buddhist robes. The sound is hypnotizing, the low-sounding chant goes on and on and on. It repeats again and again. A cat is curled up on one of the benches in front of the altar. Quiet, unmoving, almost invisible. I take his example, sit down quietly, and take in the sound. China can be challenging when it comes to food, I find. Up front I usually give up my almost-vegetarian ambitions: I know it’ll make finding decent places to eat that much harder if I insist on reasonable vegetarian options. Luckily, if you are vegetarian and you’re not too stuck on wanting Chinese food there are some pretty nice options around Beijing to try out – and there probably are good options for Chinese cuisine as well, so please leave your tips in the comments. Wagas quickly became a favourite coffee and food place for me when I discovered it last year. Luckily it’s a chain restaurant so it’s in plenty of places. The good service, nice atmosphere and almost always excellent wifi already make it a good choice, but I love their food menu. Healthy, freshly made and it includes some good vegetarian options of salads, pasta’s, curry’s & sandwiches. Favourites are the Turkish pita with roasted pumpkin (and other veggies) and the spinach wrap with falafel and hummus. Elements Fresh is another restaurant chain which serves good lunch food. I love their salads, filled with loads of vegetables. > Backyard Café, tucked away in the embassy area is a cute little cafe aiming for health and wellness with fruit juices named ‘Liver cleanse’ to name one example. Not all their food is vegetarian but they seem to mostly use organic ingredients in their dishes. > The Veggie Table is located in the Wudaoying Hutong near the Lama Temple. A fully vegan restaurant with great food. A comfortable and relaxed place, with a wide range of food and drinks on their menu. Including veggie burgers, but also apparently the best hummus in Beijing. The Veggie Plate gets their vegetables from local Beijing farms (including the Little Donkey Farm) and has an extensive explanation on why they serve the food the way they do. Further down the Hutong on the left hand side is a Chinese vegetarian restaurant, which I haven’t tried but could be worth a shot if you’re looking for local cuisine instead of curry or couscous. Looking to get your hands on organic products to start cooking with yourself? One place to get these are small local farmers’ markets. There are several around, one option is the Farm to Neighbours market organized each Sunday in Baocheng Hutong. Of course, other restaurants will have vegetarian dishes as well. But be careful, names of dishes can deceive. The vegetable ramen in a small Japanese place in District 798 looked great, but included meat after all. With these words the train attendant welcomes me and the other 1000+ travellers on board of the Beijing – Shanghai train. I’m disappointed I’m travelling at night, as I would have liked to have seen a bit of this route: along the East coast of China, past Tianjin, Jinan, Wuxi – cities that all sound quite familiar despite not having visited them yet. The last time I left Beijing by train was in an opposite direction: west, to Xi’an and on to Lanzhou and Gansu province. It turns out: not everything in China can be arranged late, especially not on an APEC-travel-inspired weekend. My plans to leave Beijing in the morning fell through when it turned out earlier that almost all trains were booked out. Until this one. So an evening trip it is. 5,5 hours at a speed averaging 270 km per hour (covering a distance of 1318 km). The next few hours will give me time to take stock of my stay in China so far: being able to spend time in different parts of Beijing this time has given me a much better sense of the change in the city since the first time I was here. I have been here quite a few times in the meantime, but I never was able to venture far away from the meeting rooms I was meant to be in. The city has become bigger, more crowded, more modern – none of which is surprising. But it also means that many of the places I remember from earlier visits have lost their charm and quirkiness and have left me a bit disoriented. It also feels the city is made up so much more FOR cars than for example Shanghai or Guangzhou that walking around it is a lot less satisfying – because that’s what I love to do: walk around cities to get to know them. Hopefully Shanghai’s energy will rub off on me a bit in the next few days. It was already noticeable when driving into the city from the airport yesterday: Beijing is hosting the annual APEC Summit this weekend. For those who don’t know, the Asia-Pacific Economic Cooperation Forum encompasses 21 countries, together making up 54% of the world’s GDP and 44% of world trade. Among its member states are the United States, Japan and China: the top 3 economies of the world. Not surprisingly, there’s a lot to talk about this week and most of which fits neatly with China’s domestic agenda as Elizabeth Economy points out: regional economic integration, innovative development and infrastructure development, to name a few. Yet, the world’s eyes are more focused on if a bilateral meeting between Japan’s Shinzo Abe & China’s Xi Jinping will happen: it would be a welcome break in a very fraught relationship. But even more than the political dimension of this summit, media in Europe (at least) is talking about the blue sky that is starting to appear in Beijing in preparation of the arrival of the expected heads of state. Factories are being shut down, cars are restricted and yes, at least today this has resulted in a bright blue – and clean – sky, as you can see above. I took advantage by being outside a lot on a day of meetings talking about China’s pollution and solutions for this. First, with a Dutch entrepreneur who has made it his business to bring promising and innovative technology to China, often with a focus on reducing pollution, for example by introducing technology for cleaner energy-from-coal production. The main take away: don’t be afraid to do business in China. Yes, there are risks but the opportunity for truly innovative technology here shouldn’t be missed. (And: China is further advanced then you might think, so make sure you really are innovative). Another meeting today was at the China office of American NGO NRDC (Natural Resources Defense Council). We spoke mostly about their work on cleaning up the supply chain in the textile industry, focusing especially on dyeing mills. This work started after research showing the extent of water pollution in China, of which the chemical and textile industry are the main contributors. By working with large retailers, NRDC has slowly built a program working with mills directly on decreasing water pollution and improving energy conservation. However, often, for companies in the textiles industry such as brands and retailers, focus is on working with their first tier supplier: the factories where clothing is sewn together. Mills are another step back in the supply chain and, especially for smaller companies, often unknown – as last week’s SOMO research showed for South-India where completely different issues are at stake. So, while large international retailers such as H&M, GAP, Nike see a definite business need to tackle this issue partly based on reputational risk, this argument isn’t as strong for smaller companies. What incentive do they have to include second tier suppliers such as dyeing mills in their CSR activities? One reason can be an increased risk of an unreliable supply chain if there is little information about where fabrics come from: mills have been closed down by local governments in the past on the basis of excessive pollution which compromises the timely delivery of fabrics and ability to maintain critical production timelines. Or the risk of hazardous chemicals in the fabrics used. It’s early on a warm and humid September morning when I walk out of the train station in Xi’an. It’s the first major Chinese train station I need to navigate my way through to find the two Chinese girls who are waiting for me at the exit. There are Chinese people everywhere. On the night train from Beijing to Xi’an I was already a bit of a curiosity. That doesn’t change here: despite the tourists that come to Xi’an for the terra cotta army, a tall white single woman inevitably stands out among the throng of short black haired Chinese. An online friend has arranged for two of her English students to meet me. Of course, I’m much easier to spot than they are and the two Chinese girls find me quickly. First stop: breakfast. I surrender myself to their menu choice and soon our table is full of steaming hot food. I have no idea what I’m about to eat and for a European stomach it is anything but a normal breakfast. After the long train trip I can’t wait to dig in. There’s guan tang bao (steamed buns), the local specialty rou jia mo (bread filled with meat), hun dun (noodle soup with won tons) and qi shan shao zi mian (spicy noodles). I love trying out so many new flavours. During my stay in Xi’an I soon discover that food is a big part of the city, also because the city has a large Muslim population. Walking around the Muslim quarter the scent of grilled lamb kebabs fills the streets. Stalls selling steamed buns are on every street corner. This is only a glimpse of my first trip to China: late summer 2006. After spending over 2,5 years in Japan in the years before, visiting China before the Olympic Games of 2008 was one of the things at the top of my list to do. The three weeks there were a journey towards the West: from big-city Beijing my destinations became ever more remote to small towns such as Xiahe (home to an important Tibetan monastery in the Gansu mountains) or the Western end of the Chinese wall in Jiayuguan. It became a discovery trip filled with sensations, flavours, scents (both the good – amazing food – and the bad – I can write a book on Chinese toilets), stunning scenery, challenging negotiations with taxi drivers or hotel managers and much much more. Little did I know that that trip was only the first of many, as I started a job working on China only two years later. Every trip since that time has its own share of stories and experiences. And yet, those three weeks of travelling on Chinese night trains, sharing a cup of tea with a Tibetan monk, walking on sand dunes at the Gobi desert have helped me to get to know China in such a different way than I could ever expect to on my work trips all of which have been unique in their own way. Without that trip, and without having the experience of seeing what life outside of first tier cities in China is like, my view of China would be much more one-sided. Hope for the people in China is not in the government, it’s not in the Communist Party. Hope is in civil society. Listening to Teng Biao, renowned Chinese human rights lawyer, speaking today in Amsterdam, this quote stuck with me as one of his few positive comments on contemporary China. He spoke about his career and experiences as a university lecturer and part-time lawyer in Beijing. His work focuses mostly on human rights cases, such as cases related to Tibet, Falun Gong or other politically sensitive topics. Doing this work at first meant that he was hindered in acting as a lawyer in these cases and he was faced with progressively increasing pressure: being disbarred, having his passport taken away, being kidnapped, being locked up, being tortured. He now lives in Hong Kong unable to return to his native Beijing for fear of being arrested. Again. Over the past two months I have been speaking with over 40 Dutch companies about the business opportunities for them in China and how to go about making the most of these opportunities. And while talking about many of the positive developments in China that have happened in the last few years, it is sometimes easy to not look at all those things that are not improving in China. Such as the position of human rights defenders. And today’s talk was a bleak reminder of actually how dire a state they are in. Under Xi Jinping’s leadership the political climate for these lawyers and other activists has been getting worse, in Teng’s view, with an increasing crackdown on movements such as the New Citizens Movement. In his talk, Teng called on foreign governments and ngo’s to keep putting pressure on the Chinese government so that this crackdown will relax. At the same time, it is unclear what effect this pressure has – but as Teng rightly points out: if you don’t say anything, you can be sure nothing changes. Fortunately, despite the doom and gloom of Teng’s perspective he also sees positive developments. Influenced by amongst others globalization, the growing penetration of the internet and ongoing activities from the pro-democracy movement civil society is growing stronger. Despite government pressure, despite the lack of an independent judicial system and many other forces working against it, the impact of civil society in China is increasing. During his talk, Teng shows pictures of protests in all forms across China. Pictures of events which wouldn’t have been allowed in any way in the 1990’s, as a keen listener from the audience observed. As Teng states, the hope of the people in China is in a strengthening civil society to contribute towards change in China. Hopefully, the commitment and dedication of courageous and admirable people like Teng and his fellow human rights lawyers and other activists will see this happen. A couple of months ago, waiting at a ground floor gate at Schiphol airport for my flight to London, the man next to me turned and said “it really is a miracle, isn’t it?”. As he said this, we were watching our plane taxi towards the glass we were standing behind and come to a perfect stop. To me, the miracle isn’t that this huge, very heavy metal box manages to stop exactly where it should, but rather that that airplane manages to stay in the sky for hours to take hundreds of people to their destination. I was reminded of that conversation this morning staring out of the window of a bus on my way to Haarlem, passing by Dutch polders and large parts of the Schiphol territory. Looking outside I see a fleet of KLM planes, planes coming in to land over our heads, planes taxi-ing across the highway to get to their gates. Most people on the bus stared with amazement and maybe some with travel envy to the planes taking off or landing in front of our eyes. Travel hasn’t lost its appeal or its wonder for me. Being on a plane, well, that part is not my favourite but the idea of travelling to somewhere far away, waking up after a long flight – or preferably, an overnight train – in a new destination is still one of my favourite things. And I can’t wait for some of the exciting travel coming up in the next few months. Business ánd pleasure. This month I’ve changed offices: in June I was still mostly working from either meeting rooms in the VNO-NCW building (the Confederation of Netherlands Industry and Employers) or somewhere in the building of the Ministry of Foreign Affairs – conveniently located across from each other. This month I’ve started commuting to the Amsterdam Zuidas, the financial center of the Netherlands where I’m working in an office with a great view across the city. Talk about changing perspectives: from governmental The Hague to corporate Amsterdam. I’ve not only changed physical locations but also type of work. From researching how six European countries have organized their trade promotional activities to support their SMEs to be successful on foreign markets, I am now interviewing Dutch companies on their goals for the Chinese market in preparation for a trade mission this autumn. Even though I started working independently in 2013 it felt almost as if I was cheating a little with one regular assignment for the year, with smaller bits and pieces to do alongside of that while I worked on setting up the essentials of my business. This year has seen a big transition to smaller and shorter term projects, which means my work is (much) more diverse but at the same time also more complex to manage well. So this year is throwing new challenges my way but at the same time I love the journey of discovery this is becoming. Can’t wait to find out what the second half of this year will include. Have you ever thought about how travelling abroad and living abroad has influenced you? Maybe only by becoming more open and curious about the world but it could be much more radical: maybe meeting the love of your life or deciding on a radical career change. When I was 16, I spent a year in Hobart, Australia. Looking back, that year changed everything. Of course, none of those changes happened immediately after but my life would have been so different if I hadn’t left a small rural village at age 16 to go to the other side of the world, living with a family I didn’t know, going to a completely unfamiliar high school and meeting other exchange students from the rest of the world. Doing this definitely ranks at the top of my best decisions made so far. During my years at university, I studied and worked abroad again a few times. And of course, I travelled – in Europe, in Asia. I’ve always thought that some time abroad is so good for anyone to experience. Last Sunday this idea was confirmed again. During Sunday afternoon drinks with my parents’ neighbours, I started talking to one of the neighbour’s daughters: she had recently been to China on a high school exchange. She had participated in an exchange programme via her high school facilitated by Jialei & Co. I had heard about this organisation before and it was interesting to hear the experiences of a high school student who had participated. But what I also loved about talking to her was not just to hear about how she perceived China but how her curiosity had increased, and how she now seems more open to try new things. She had only been away for 10 days but had tried things in China she would’ve just refused at home. Sometimes the reason wasn’t only curiosity to try things, but also respect for her hosts: because you don’t refuse to eat something you’ve never tried before but which your host has spent more than an hour preparing in the kitchen. The result is the same though: discovery. Of new things, new food, new ways of looking at the world. A perspective of the world that doesn’t automatically assume that the way life is where you are at, is the way things are everywhere – or the way they should be. And that’s a lesson no one can take away from you anymore. It’s not right, it’s not wrong: it’s different. I can’t tell you how many times since this sentence has popped into my head, wherever I am in the world. If it would be a contest, China is in pole position. Last week I attended an evening at Pakhuis de Zwijger about Chinese cities in Africa, and the above is what has stuck with me. The evening was centred around the research of Michiel Hulshof and Daan Roggeveen within their Go West Project, where they are travelling to African cities to research how Chinese activity in Africa is influencing these cities. China and Africa are becoming more and more connected: some examples of this are through Chinese investment and through Africans setting up in China. There has also been increasing attention on this activity, as China’s engagement with Africa is happening on very different terms than European engagement with the African continent. The evening highlighted specific activities of China in some of the places that the duo has travelled to so far (including Nairobi, Lagos, Luanda, Addis Abbeba – to name a few African cities): development of mass housing and establishment of Special Economic Zones. throughout the evening, the language used was very much in terms of a contest: who can build the most and the biggest (buildings, infrastructure, etc) and who can tie African governments to their own country the strongest? China isn’t the only country that is actively seeking opportunities in Africa – others include of course European countries, but also for example Turkey and Brazil. But is it really a contest? Is it really about being the most important non-African governmental actor (in whichever form) on the African continent? I don’t know – in traditional geopolitical terms, possibly it is. But in terms related to how to progress on sustainable development in Africa I don’t think it should be. the evening shared different examples of Chinese firms building mass housing complexes in African cities, or of establishing joint economic development zones with a local government authority. Yet, what didn’t come through much in these stories was what the impact is on the development of society in these African cities: how does living in a gated compound (copied from the Chinese model of housing) change the social structure in any given African city where the way communities were living will have been very different. what is the contribution of Chinese investment to economic and sustainable development of African cities and communities? What comes across in the contributions of experts during this evening is that the Chinese firms come in with their own workers (though this is slowly changing), underbid local African firms and are only recently becoming more interested in contributing to local capacity building. Some Chinese firms are starting to engage in a more active CSR-policy (and in fact, the Chinese government is requiring companies active in the extractive industry to implement CSR in their operations) and during the evening Huawei was mentioned as an example of a company which is developing a local CSR programme that focuses on local capacity building. Yet, building the skills and capacity locally across Africa will be important to contribute to future-proof development. Finally, the conclusion of the evening was also that it isn’t possible to ‘just’ copy the Chinese model to gain similar results in development and economic growth. Parts of it may work, but Africa is – of course – a different place. Africa is not one place, and it is likely that the Chinese model can be more successfully implemented in countries with a more authoritative government (examples are Ethiopia or Angola). In any case, yet again an interesting Go West Project to keep track of while the research into the influence of Chinese urbanism in Africa continues. ‘Rotating curation’: does that ring a bell? If you’re on Twitter you may not know the official name but you might have seen them pop up: they are Twitter accounts with an account holder which changes weekly (usually), often used for accounts connected to locations: countries, cities, etc. I have followed @sweden for a while now, apparently the first of these #rocur accounts, but until last week I had no idea of the huge amount of accounts there are. That is, until I curated one of those accounts: @I_am_Europe. I applied for the curation for a few reasons. The main one being that it seemed like fun. Also a new way to have unexpected conversations, find interesting people and so on. A way to learn a little more about what works on Twitter in terms of engaging an audience. And maybe an opportunity to share and talk about some of the topics I think are important. It was fun, but definitely also a learning experience again on the dynamics of Twitter. Interacting via a ‘new’ account and (partly) on a timeline of people – and group of followers – you don’t know is really quite hard to do at first. Of course, I could use my existing contacts – and I have sometimes – but I was also looking forward to be able to add to any new conversations. But it takes time to figure out who is who and what people are talking about. Partly a continuation from the previous point, I underestimated how much time it would take to do well. Especially with my original plan of discussing some topics backed up with a bit of research and deciding how to integrate them in a day of tweeting without feeling like I was pushing these topics too strongly. And getting stuck in an unexpectedly chaotic work week didn’t help…. Considering those two points, it was very interesting to see what people replied to, favorited, re-tweeted. And mostly they were pictures of my city, pictures of shopping for food at the local farmer’s market or sharing excitement about an upcoming Arcade Fire concert. Huh… so much for interacting about all those other topics. I used Wednesday most to share some other things, which on that day was mostly RT’ing and talking about the 25 year ‘anniversary’ of the Tiananmen Square protests on June 4th, 1989. An occasion I felt deserved a lot of attention. Being ‘I_am_Europe’ also gave me access to some other sources and some people helped me out in finding some difficult-to-find data for research I’m working on. Yay, thanks again! All in all, fun week! And I hope that the 1200+ followers of the account enjoyed my tweets of course. But also, for me it proved that engaging and interacting on topics on Twitter that go beyond the daily details is difficult and takes time to work on – not just with physical time during a day to be online, but also time (weeks, months, …) to build an audience and a connection with that audience. Suffice to say, using social media successfully isn’t easy…. Tackling climate change: mainstream or frontrunner? Yesterday afternoon I read an article on the website of the Telegraaf, the largest daily newspaper of the Netherlands, in which the paper shared the results of an online poll that had been running the day before. The statement being polled was: “Climate change is complete nonsense”. The result: 61% agrees it is. The more I read in the article about the rest of the results the more depressing it was. 80% doesn’t worry at all about the consequences of climate change and people believe environmental organisations are only in it for the money. Half an hour later I was on my way to something I knew would make me feel a lot more positive again about what’s happening in the world: with a group of people at Den Haag in Transitie (DHiT), a local transition network, we were going to spend an evening talking about how the many local initiatives happening at DHiT link to major global issues such as climate change, environment, energy, etc. It was a really fun night where people were talking about solutions and opportunities to make changes and how to make those possible. I came home energized, inspired and with lots of new ideas. So what is more important or the most effective way forward? Finding ways to get everyone on board or supporting those small groups of people way ahead of the mainstream in making things happen? http://www.machi-consulting.nl/wp-content/uploads/2013/04/MAC-logo.jpg 0 0 admin http://www.machi-consulting.nl/wp-content/uploads/2013/04/MAC-logo.jpg admin2014-05-29 17:09:482015-02-24 12:33:09Tackling climate change: mainstream or frontrunner? PS, looking for some good suggestions for Japan? Try some of Koreeda‘s beautiful movies. Time for a confession: I’ve loved all the things Japanese in Shanghai while I was there. Of course, Japan and China are tightly linked together. In all manner of ways: historically, culturally, (geo)politically, economically – and usually, it’s the bad stuff that hits the media. The rows (admittedly, across East-Asia, not just with China) when a Japanese PM visits Yasukuni shrine. The disagreement on the Diaoyu/Senkaku islands. And really every time that Japan or a Japanese politician does something that doesn’t agree with its neighbours. 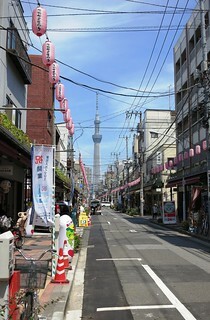 Most obvious are all the Japanese restaurants in the city. Anything you’d like you can eat: of course sushi and sashimi, but there are tons of ramen restaurants, Japanese curry, and I also found okonomiyaki and takoyaki. All the major chains are here: from Saizeriya to Yamazaki bakery and from Ippudo ramen to Yoshinoya. And for good prices – or at least, much better prices than at home so I’ve filled up on my Japanese food cravings for a while. They’re popular with the Chinese too: often the restaurants were very busy. There’s more Japanese food: in the few supermarkets I visited there were a lot of Japanese products on the shelves. Typically Japanese food (like the curry packets or instant noodles) but also lots and lots of choice in sweets and chocolate. Again, good news for my regular need for some Pocky’s. In retail, the perspective is the same. And I also think some of these brands have fairly successfully re-branded themselves as non-Japanese. That is, it’s not visible much that a certain brand is a Japanese brand – the ads are clearly focused on Chinese, or use Caucasian models (as is the case for Uniqlo for example). Other products do use Japanese words and characters a lot: it’s almost as if there’s been no effort at all to market their product to a different audience – which is the case a lot for the candies and sweets. In the various galleries and museums I visited there were often a lot of Japanese artists and designers featured. That they are also popular was demonstrated by the massive crowd at the Kusama Yayoi exhibition at the Museum of Contemporary Art. So, what is really happening in the China-Japan relationship? They are clearly economically dependent on each other so how does this reflect on what people think? When I mentioned or spoke about this to Chinese people I met I got the impression that for the younger generation Japan is often an example of how to organize a country: wealthy, clean, and organized. Several Chinese people I know are learning Japanese: whether out of personal interest, or because they feel it will increase their future career opportunities. The bad stuff is, of course, there too: the memorial for the Nanjing massacre was renovated several years ago and now offers testimony to the drama that occurred at Nanjing in 1937 at the hands of the Japanese army. Unfortunately, for the second time I was unable to actually see the exhibit myself (this time I found myself in front of a closed memorial; the other time it was under renovation) so that is still on my list of things to do when I’m next back in Nanjing. Of course, most of these examples are anecdotal (I’m sure there’s research about this out there) but maybe, if it were (more) up to the younger generation, the Sino-Japan relationship might not be in such dire straits. A quick google already revealed some research on this of course: this is a link to the Genron China – Japan public opinion poll results of August 2013, which looks at how people from one of these countries perceive the other. Not surprisingly, after all the problems in the bilateral relationship, the disapproval rates are pretty high…. Also, this Pew research of last summer has interesting numbers on the view in Asia towards Japan. The China numbers seem to match the numbers of the Genron poll above. Pew also includes many other countries in the region in their research (scroll down to the last paragraph of the article). Following up from my post in October, I now know a little bit more about Nümph‘s policies on responsible production. I understand that it’s difficult for a company to be open and transparent about these topics – especially when it’s ‘just’ a random customer asking. From the information I’ve received the company follows regulations on e.g. REACH and child labour. Several of their producers in China are BSCI-certified. Hopefully some of you can relate to this situation. When you find the perfect dress (or jacket, skirt, etc), but then before paying at the counter you think you should also really ask the staff if they can tell you anything about the brand’s CSR policy or about local production circumstances. I.e. does the brand you are intending to buy from operate responsibly? Of course, the staff doesn’t know. I’ve never actually had an answer that made sense when asking this question. So what do you do? Put back the gorgeous dress because you don’t know how the brand does business, or do you buy it anyway (thereby negating any impact your question might have made: clearly you don’t care at all)? Of course, when talking about international CSR policies of companies in the Netherlands, you quickly hit the textile industry where this has been a major issue this past year, spurred on by the incidents in Bangladesh. The collective industry has come out with an action plan with the objective to drastically improve the supply chain of Dutch companies in this sector. But another thing that is related to this is being transparent about what a company does, and what its supply chain looks like: what do brands show and say about their business operations? I believe that increased transparency will help a lot in encouraging responsible business practices. If a consumer can tell where the clothing he or she is planning to buy has been produced and how, this can (hopefully) influence someone to buy the better product (though, of course, there will be many a dilemma like the one mentioned above). I’ll soon share a project I’m working on with CHFC that aims to contribute to increasing that transparency. But in the meantime: I want to know where the things I wear are made, and how. There are different websites where you can find fair fashion brands (such as here or here) which helps of course. But what about the brands I already wear? And sadly, I can’t really find reliable information on those on, for example, GoedeWaar or Rankabrand. Without turning this into a travel blog, I can’t resist sharing some of my discoveries in Hong Kong this past weekend. I’m not a big shopping fan, and on top of that I’m not a big brands type of shopper: finding those big brands is very easy Hong Kong. It still surprises me that a city can sustain this scale of luxury retail. But of course, there are other places as well. One shopping mall that I really enjoyed is K11, a smaller mall that combines art with shopping: there are several art installations set up inside which makes it a fun place to walk around. The shops inside are a combination of well-known brands (lots of sports gear, but also shoes and bags of course). But part of the first floor is devoted to designers with some smaller shops selling really creative and funky clothing, accessories etc. And, don’t miss the amazing book shop on the top floor which has great stationery, office material and – of course – books on design, fashion, photography and an extensive kids section. Qips is a stationery shop in the Miramar Shopping Centre on Nathan Road (and also on Hoi Ting Road, according to the website): a place to browse all their really smart things to use for paper and more. Of course, they sell many things you never thought you could need at all as great stationery seems to be very hard to find in the Netherlands. Much of the stuff sold here was Japanese, which isn’t surprising. So, if you are looking for quirky post-its, markers or clips, this is a great place to go (also makes for some unusual small give-aways). Apart from shopping, eating & drinking are very easily done in Hong Kong: there’s an abundance of restaurants, cafés, etc. Which also makes it difficult to choose and find some nice places in the midst of all those on offer. My Saturday night was spent at the following places which I all really enjoyed – though be warned that none of these get you into any local Hong Kongese places: the clientele is mostly expat. Start off your evening with a few glasses of wine, and some people watching, at Staunton’s Wine Bar, nice place just off the escalators on Staunton Street. They serve a pretty wide range of wines. For dinner, and especially if you are looking for some meat-less options (which I always find difficult in Asia), Life just below Staunton’s Wine Bar is great: an organic and vegetarian café and restaurant, which also does take-out. The restaurant has a roof terrace upstairs, and unusual food options on the menu. I loved the spicy tempeh burger. And to close off an evening in Hong Kong in style, head to the other side of the river for a cocktail at Ozone, the top floor bar at the Ritz Carlton in the ICC. The view from the 118th floor is simply stunning, from where you look across all of Hong Kong Island. > use the airport express to get in to the city: you can buy a ticket (for around $100) at the counter as soon as you get out of the luggage claim area to avoid the queue at the counter in the main arrivals hall. Trains run every 10 minutes, and reach Kowloon and Hong Kong in about 25 minutes. > get an octopus card: a travel pass that is charged with money so you swipe your way on to the metro, tram, ferry, bus etc. Supereasy. > use the tram to travel up and down HK Island and to see a bit of the city at the same time (most trams only travel from East to West so you can’t really go wrong with any of them) and take the Star ferry to cross between Hong Kong Island and Kowloon which is a really nice 15 minute way of travelling (except when you’re in a rush: then the metro beats both of these modes of transportation). I wasn’t sure if I should use this because it also leads to a lot more questions. Such as, what is the state of small business entrepreneurship in Japan now? What changes are needed in the regulatory environment to make this happen? Etc.So, imagine my luck spotting two articles tonight that talk about these exact issues. Prime Minister Shinzo Abe’s economic policies (in popular terms: Abenomics) consists of several pillars – or ‘arrows’ – of which the third is Abe’s strategy for growth. Policies include liberalising the domestic labour market, expanding the opportunities of women in the workforce, promoting green energy use and deregulation.And these are exactly the things that are needed to create a business environment in which young entrepreneurs and new start-ups can succeed, as the Japan Times today discusses. In this article several companies are highlighted, mostly in the IT-industry, which are great examples of how a single entrepreneur can build a successful company such as Gree, Inc. and DeNA. Yet, the article also mentions that the success of Abe’s policies is essential in order to grow a more entrepreneurial business environment. 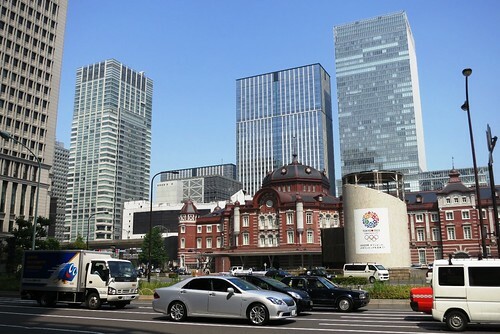 A second article, found on East Asia Forum discusses a related topic: the lack of internationalisation amongst Japanese small- and medium-sized enterprises (SMEs). These companies mostly work as suppliers to the large multinationals, many of which we all know like Mitsubishi, Toyota etc. The article gives some reasons for this limited international reach, amongst which several external factors (eg, underdeveloped infrastructure or inadequate legal systems in neighbouring countries). It also mentions several domestic factors such as the lack of English-speakers in the Japanese work force: how can you do business abroad when you cannot communicate with potential partners or customers? (in the case of Japan, I would argue it can also be very beneficial to have Chinese- and Korean-speakers amongst your employees). The post on East Asia Forum also looks expectantly towards Abe’s third arrow – and notes the opportunity for Japan’s SMEs of increasing regionalism in Asia with several regional trade deals being negotiated (the RCEP, TPP and a China-Korea-Japan FTA). Pedestrian space: essential to liveable cities? http://www.machi-consulting.nl/wp-content/uploads/2013/04/MAC-logo.jpg 0 0 admin http://www.machi-consulting.nl/wp-content/uploads/2013/04/MAC-logo.jpg admin2013-07-15 18:31:262015-02-24 12:17:24Pedestrian space: essential to liveable cities? When ChinaFile was launched a few months ago, I looked on enviously. What a great discovery: a website full of relevant articles on any topic that is worth knowing about when it comes to contemporary China. With a few articles posted daily, my reading speed can’t quite keep up. But also: wouldn’t it be great if a similar website existed in the Netherlands, writing from the Dutch/European perspective on China? Maybe I wasn’t the only one thinking this: over the last few weeks two Dutch websites have launched with one focusing on Japan and the other on China. Both of these websites publish regular articles on current affairs in either Japan or China, with a range of topics covered from design to social issues to politics and doing business. 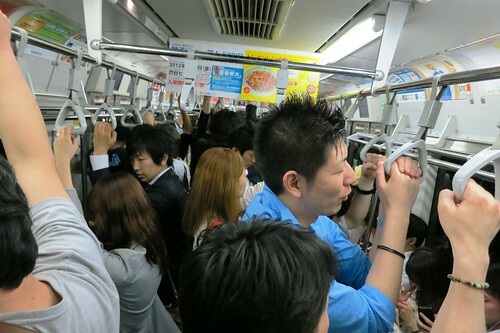 Katern:Japan has been going for a few weeks now. The site is easy to navigate with the different categories listed at the top. With several writers there is a steady flow of articles published which are easy to read and cover many different issues. Interesting to follow for anyone interested in modern Japan, although I also noticed that a ‘economy’ or ‘business’ category seems to be lacking. Maybe this will change in the near future. The newest ‘kid on the block’ is China2025, a ‘crowdblog’ with a similar format to Katern:Japan: a range of writers covering different topics. 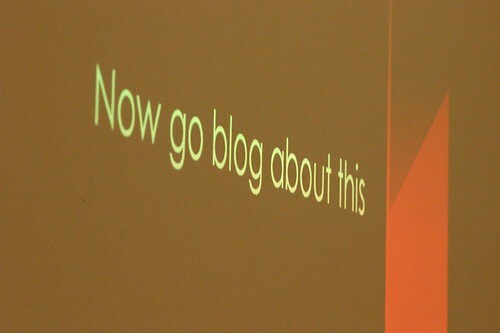 But only launched this week, it’s more difficult to assess how this blog will develop. The categories are a little harder to spot, they can be found in a tagcloud in the right column. I’m looking forward to see how this blog will develop from now onwards. This afternoon, I visited an exhibition in Tokyo called Design to change the future: Business with social innovation in 2030. Sounded promising, as did the location – next door to 21_21 Design Sight where I saw a great exhibition last year on local crafts from the Tohoku region (and if the long queue of people waiting there today is any indication, they have something great on again). 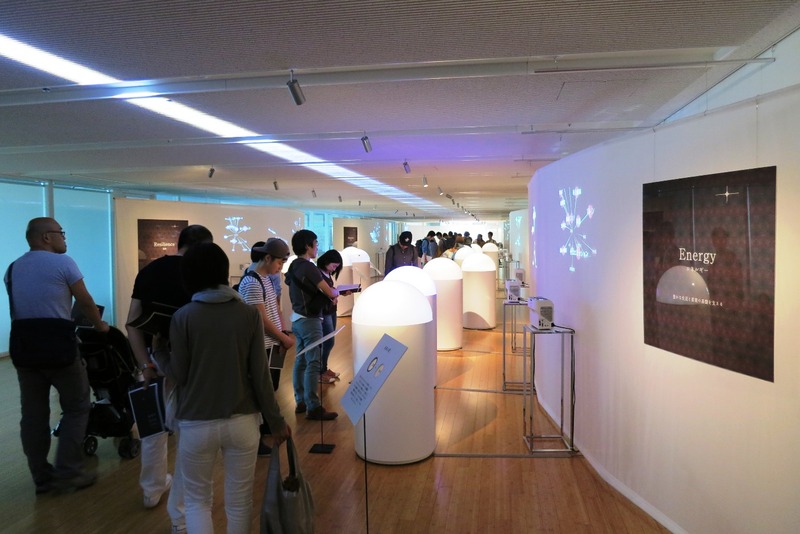 The Mirai Design exhibition tries to provide answers to the question: 社会課題を解決できるのは誰なのか？ Or: Who will be able to solve the issues in our society? A very relevant question, not just for Japan, and I was looking forward to see some creative and new initiatives or designs which might really be able to trigger change. The exhibition was small and divided across five themes: energy, agriculture, education, community and resilience. Each topic had 3-5 examples of ‘solutions’ for a social or environmental issue. However, walking through the exhibition and taking in these examples, I was underwhelmed. To say the least. All of the examples came from major Japanese – and a few foreign-based – companies, for example NEC, Mitsui, Fujitsu, etc. Of course, this isn’t bad. But I also wonder if real innovation will come from these large companies. Especially when I see many smaller scale initiatives starting up (in Europe or the US) which seem to challenge the status quo much more. None of the examples were bad things, of course. And from their description, a clear sense came through of the companies’ conviction that they have a responsibility to contribute to society. This is one thing that also came up earlier this week, and was explained to me as a way of thinking originating in post-war Japan. At that time Japan’s economy was devastated and needed to be built up again: being ‘good’ companies and working as hard as possible at making money and thereby supporting the recovery of Japan’s economy was seen by many companies as their contribution to society as this would in turn enable Japan to grow more prosperous and provide for its population. This mentality is still visible in CSR-related activities as well, in which community engagement is a strong part of CSR policy. And it’s great that companies feel so connected to their local community. Back to the exhibition, where the examples included the promotion of less industrial and more organic farming, volunteer work in the Tohoku region, organizing study tours abroad for volunteers, increasing the usage of organic cotton and game-ifying education. In short, a nice exhibition of some nice projects. But all of these things are happening NOW (luckily). Don’t we need something more radical? I was hoping for a real look into the future: what could our world be like 17 years from now? That would be a great question for some creative and innovative thinkers & designers to work on and design for. I would love to see it. I’ve just finished my last meeting, closing off this week with an interesting dicsussion with officials from the Ministry of Economy, Trade and Industry and a Ministry of Foreign Affairs representative talking about CSR policy in Japan, but also answering their questions on CSR in the Netherlands. Interestingly, they see the Netherlands as one of the leading countries on CSR, accentuated by for example the GRI conference in Amsterdam this week, a new Dutch appointment at the OECD for the Working Group on Responsible Business Conduct and many Dutch speakers at the upcoming Global Conference on Responsible Business Conduct in Paris in June. Their first question started with exactly this: why is CSR so important and prominent in the Netherlands…. I hope my answer made sense! But looking back at this week, I have gained so much more knowledge and understanding of this topic in the Japanese context. So I am very happy with how this week has gone and the many different people I’ve had the opportunity to speak with. Of course, there is still much more to learn and many more people I would love to talk to. Next time. As I’m sipping a coffee, I’m also mentally listing the main points of this week. I’ll add them here below in short bullets, in case it will take me a long time to write out all the things I’ve learnt more fully. > the local ngo’s have a relatively weak position vis-a-vis the general society and business. Sustainability is not only something that should be on the minds of companies. But also on the minds of consumers. At least, that’s what I think (and admittedly, I’m a long way from being the perfect sustainable consumer – if that exists). So, I’m also keeping an eye out here for what I see in the shops, out on the streets, advertisements etc – anything that can help me to discover how much sustainability is part of consumption in Japan (which is a country of consumers, much more than in Europe). This may be organic food, plenty of vegetarian choices (or even vegan food choices), fair trade products, fair fashion, etc. Walking around Shibuya yesterday trying to find some great sushi (you would think it was on every corner in Japan… sadly, no), I was misled twice, thinking that I’d found something that fit this image. A very very common sight on the Japanese streets are convenience stores, small shops where you can buy pretty much anything you might need right then and there. Food and drinks mostly, but also magazines, and assorted other products. Lawson is one of the large chains for these convenience stores, and they pop up everywhere. However, I was surprised to see a new type of Lawson in the streets this time: Natural Lawson. 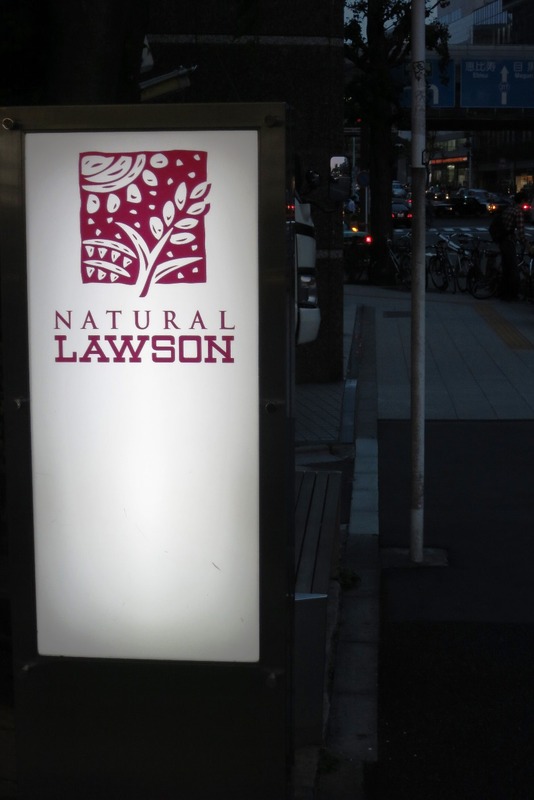 I walked into one last night to see what is ‘natural’ about this Lawson, expecting to find a store with only – or mostly, at least – organic or other fair products. The chain does have its own branding and its own packaging for products etc, so it’s not just a side-project I would think. However, in the shop itself I couldn’t spot much difference. Yes, there are a few shelves of snacks and food which look to be more from organic food brands. But the rest of the shop looked mostly the same as every other Lawson I’ve been in. I’m a bit puzzled why a seperate chain had to be set up for this, instead of incorporating the few shelfs of organic products in the regular Lawson’s. And probably increasing the chance of these products being bought. So, I continued walking around still trying to find sushi. I was about to give up when I saw a huge sign of a restaurant called ‘Vege-Teji-Ya‘. A vegetarian restaurant in Japan… sounded promising enough to give up my search for sushi. 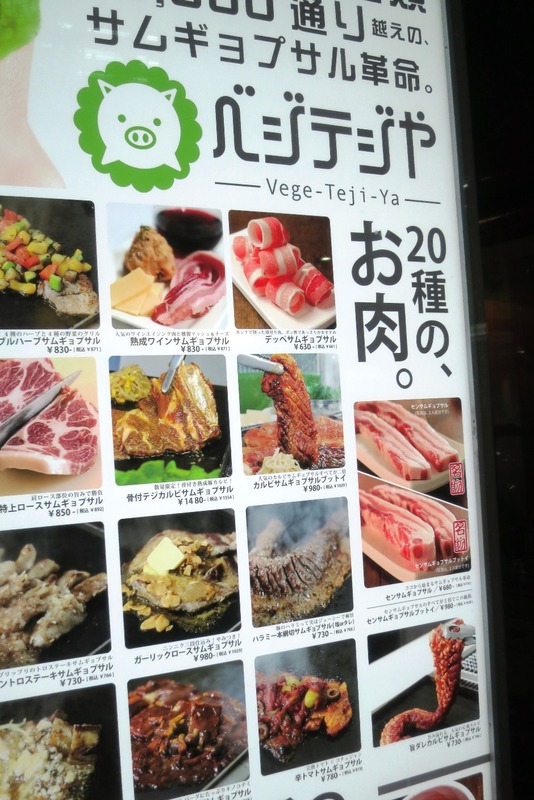 Walking over to the restaurant, and getting a closer look at the advertisement and menu – imagine my surprise when somehow the name of the restaurant was anything but related to vegetables, but instead with just about every part of pork. The sushi that I did find in the end was fortunately very good. Fortunately, especially, as it accidentally also turned out to be the most expensive sushi I’ve ever had. Oh well, another lesson learnt in Japan (i.e. if there’s no menu, ask for one to find out where exactly you walked into). 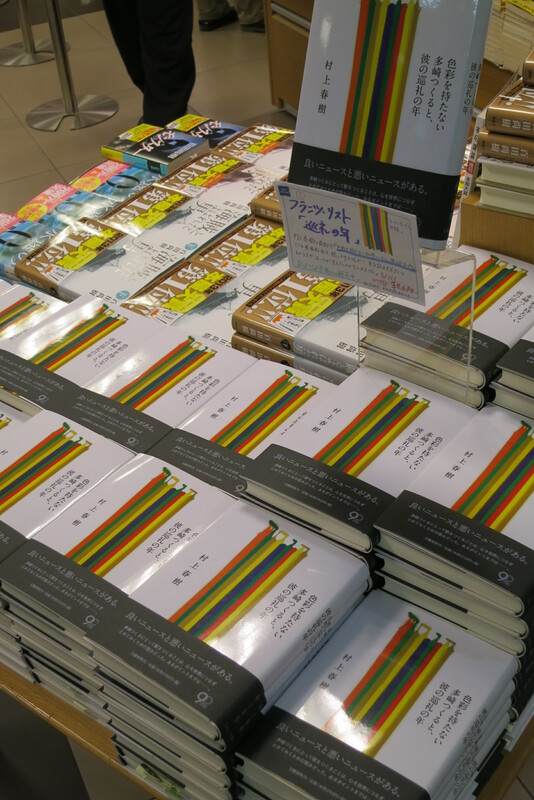 Haruki Murakami is probably the best known Japanese writer outside of Japan right now. And he has been for quite some time. In the Netherlands, his books are very popular and many of my friends have read his work. Not surprisingly, maybe, I’m a big fan. This is no different in Japan. There always seems to be quite a buzz when he publishes something new. So when I heard about the publication of his latest book on April 12th, I knew exactly what was at the top of my shopping list: 色彩を持たない多崎つくると、彼の巡礼の年 (in English: Colorless Tsukuru Tazaki and His Years of Pilgrimage). One topic that is coming up in many of the conversations here this week is the place of women in Japanese society: after years of coming to Japan I still see barely any change in the inequality between men and women here. There are various reasons for this I think, the corporate culture in Japan, how men view women, lack of facilities such as child care, and so on. Not only has this come up in conversation, a few articles popped up this week that talk about this as well, and before starting a longer piece to go into more detail, I thought it’d be nice to give a quick overview of these articles. The BBC wrote about women in Japan, with an article called The worst developed country for working mothers? A title like that doesn’t promise much good, and it explains some of the reasons why Japanese women are so little represented in the workplace. This inequality between men and women also shows when the story of a man (not coincidentally, a foreigner in Japan) taking care of his children becomes a news item. Why should this have to be news? Luckily, it’s not all bad: recently a group of women (Japanese and foreign) established the Nishinippon Business Woman Association: committed to promote women empowerment in the Japanese business world. Great initiave, also because it is (far) away from Tokyo where changes in the traditional role pattern have probably changed most so far. And, I liked this innovative initiative started in Tokyo to enable women to be part of the workforce, especially when they are working independently: a co-working office with space for your kids. Enjoy reading, and more soon. This is a regular view during my current workdays in Tokyo: working on my laptop with coffee, reading new material or preparing for a next appointment, in between meeting someone new. And yes, surrounded by many others doing something similar. Welcome to Starbucks in Japan. Free WiFi in cafe’s doesn’t seem to be as ubiquitous in cafe’s here as it is in the Netherlands by now. So, Starbucks has become my lifeline – it seems to be the only place I can depend on to offer free WiFi (and power plugs, I discovered tonight). Luckily they are everywhere. Unfortunately, you can’t just walk into a Starbucks and start surfing away – which was a surprise the first time I tried that. They ask pre-registration (at home, for example) so you can log in with your own name and password each time you’re in a new coffeeshop – anywhere in the country. To take a break from Starbucks Caramel Latte’s etc I spent a few hours this afternoon at the Tokyo location of Seats2Meet, based in Ginza. I’d heard a lot about it, so I’m happy to finally have been there. It’s also led to many new ideas, so a post on co-working in Japan will hopefully follow later this week. The good thing about not having had enough preparation time for this week in the Netherlands? I still have some holes to fill up in my schedule this week. I guess I knew this would work out. As this week progresses, I am finding more and more people to talk to. So, after the realization yesterday that NGO’s in Japan are generally considered to be fairly weak towards companies I now seem to have found an NGO who is active in monitoring corporate behaviour. And hopefully I’ll be able to meet with this NGO at the end of the week, to get the other side of the story. Good stuff. Do you gain trust by being transparent? Or do you become more transparent when people trust you? These are some questions I’m left with after getting a bit more perspective on corporate social responsibility (CSR) reporting in Japan today. According to a 2011 survey of KPMG, 99% of Japanese companies publish a CSR report. An impressively high number, especially when you realize that there is no government regulation telling them to do so. And, not only do many companies report – these reports are also easily accessible. No less than three (competing) Japanese websites focus on sharing CSR reports online and offer related services, such as extended search options, a report cover design award and seminars on this topic. But most of all: they offer exposure of these reports. Today, I spoke to the people behind one of these websites, CSR Japan, about their work and about the characteristics of CSR reporting in Japan. I initially contacted this organisation as I assumed it would be the CSR association in Japan, much like MVO Nederland is in the Netherlands. The information on their website quickly showed their focus on collecting CSR reports (the website currently contains almost 500 reports of over 200 companies) and making these accessible. I haven’t seen anything similar in the Netherlands, and I love how you can really search the relevant themes you want to know about – and it will give you the individual pages from the various reports. Imagine how much easier that makes it if you want to compare what various companies write about supply chain management, to give just one example. And on the plus side for companies who have their report listed here, they can get an overview of what pages have been viewed how often, and there’s a weekly ranking of the most searched for topics. This week, the top 5 consists of: company mission, work-life balance, investor relations, biodiversity and ‘relation with society and the environment’. So, why are these companies happily writing these reports, while in Europe there is a debate going on that making reporting mandatory will lead to higher costs for business? Why are Japanese companies doing this voluntarily? CSR Japan explains this through the fact that there have been some major environmental disasters in Japan in the past (of which a well known example is Minamata). This has increased awareness from the public and from companies that it is important to be transparent about their business activities and their (environmental) impact. Because indeed, the reports of Japanese companies seem to focus more (in comparison to for example European reports) on environmental than on social aspects of CSR. This also came back in other talks I have had today. The explanation for this may be sought in the fact that Japan has developed their own guidelines for reporting, but these focus solely on environmental issues: Environmental Reporting Guidelines by the Ministry of Environment. Luckily the other topics are partly covered by reporting through a combination of these guidelines, GRI and ISO26000. So, it appears that Japanese companies are mostly transparent about their activities – which is of course very good. We then spoke about who reads the reports and whether or not this makes companies vulnerable. In Europe and the US, NGO’s sometimes maintain a type of watchdog function to make sure that companies are behaving correctly – hence the vulnerability by reporting what you do, or do not do. Interestingly, Japanese NGO’s do not seem to have this function at all – and in fact are usually very trusting of Japanese companies. There are hardly examples of big campaigns being set up when something has gone wrong, because it turns out that much more than in many other countries the population of Japan overwhelmingly trusts its corporations. And doesn’t particularly think of the NGO-sector of being trusted to do the right thing. This interesting bit of information comes from the Edelman Trust Barometer, which I heard about in a later meeting, and which surveys the level of trust annually across around 20 countries worldwide in the government, the media, business and ngo’s. This is quite a different view towards corporations than for instance in the Netherlands, where it sometimes feels that NGO’s have no trust at all in companies (and where in fact some NGO’s and politicians are calling for more regulation and monitoring on CSR topics to ensure that companies will not do anything wrong through their business activities). I also feel that this situation changes the dynamic of CSR in Japan, compared to Europe. It may be too early to draw that conclusion, after only a few discussions. Of course you would hope that the watchful eye of NGO’s and consumers is not the sole reason for companies to behave responsibly. However, knowing that you are being held accountable for your actions – or maybe rather, knowing that no one is really watching what you are doing – must make for different choices in putting together and implementing a company’s CSR policy. Which brings me back to the question: does transparency beget trust, or is it the other way around? Sunday night, and I’m writing this after a whirlwind weekend in Osaka and after having prepped my meetings for tomorrow this evening in Tokyo. Tomorrow is the start of a week to discover in person (instead of through reading online articles or books) what is really happening with corporate social responsibility and sustainability in Japan. Is it on the agenda here? And if so, what are the main issues? Some (many?) things* in daily life in Japan make me wonder if it is a concern at all for people living here, so I guess there’s only one way to find out. I’m very excited to be heading into this week, one of the biggest things yet to do in my short career as an independent advisor on these topics. I have many questions to hopefully have answered this week, but at the same time I have no idea really what kind of results this week will bring. I do know one thing for sure: I’ll be one step closer at being successful in my work. It’s also the first time to be on a work trip that I’ve put together completely on my own – and this feels good as well. Especially because the last few days have seen the addition of several new meetings during this week which means I know have a varied and interesting week ahead of me. I have meetings with business (both Japanese & Dutch), with academics working on CSR & sustainable urban development, with several organizations promoting CSR & sustainability in one or the other. And I have a few places on my list to visit while I’m here: the newest co-working space in Tokyo based on a Dutch concept and an exhibition on ‘design for the future’ to name a few. I hope to be sharing my ideas and thoughts about this week as they form, and of course to show you a little more on what Tokyo is like. To be continued! * to name a few of those things: the plastic EVERYWHERE, heated toiletseats, difficulty in eating vegetarian, etc. I will write some more about these later. Arriving back in Osaka is always good – it’s a city I know, where I can wander around a bit without feeling lost, and where I don’t have to feel guilty about not doing something exciting and new every minute of the time I’m here – as I would in an unknown city. Nevertheless, this time I look around me a bit more those first few hours in the city – or even, on the way from the airport. The drive from the airport to the city takes you through industrial Kansai: a long stretch of the Osaka port, metal and steel refineries, LNG storage, logistics hubs and much much more. Again, this time, I think that cities in Asia (or at least the big cities in China & Japan) are like cities of the future: the images we know from sci-fi movies with endless city, skyscrapers as tall as we can imagine, quadruple fly-overs. In Osaka this is not surprising, as it is the third city in Japan with an industrial base to match. 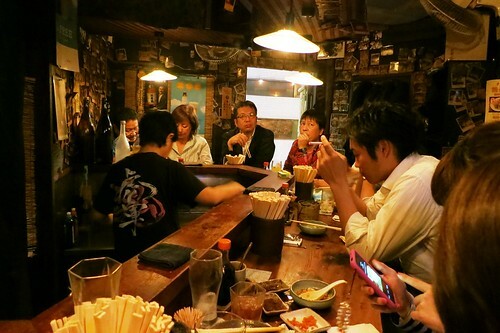 Nevertheless, happy to be back and to be ending the day in a relaxed izakaya with great food, a beer and listening to the banter in Osaka-ben around me. When it comes to news on CSR in Asia, this week has been all about the collapsed factory in Bangladesh. As I’m writing this, the news is announcing a still rising death toll, up to 500+ by now. A tragedy. And I feel it does show that the prices we pay for our clothes in Western Europe are not sustainable, least of all for the people who manufacture these clothes. Would it kill us to pay a few euro more for a t-shirt so that other people can have a slightly better standard of living? The problems in Bangladesh’ textile production industry aren’t new, and a search on the BBC News site will bring up reports from many accidents over the last few years. A change is long overdue. Today I also heard the news that Disney is withdrawing its production from Bangladesh (and several other countries). * Apparently this had already been decided after the fire in a textile factory in Dhaka killing over a 100 people in November 2012. However, even if this may be an effective way for Disney to reduce its risks, this can’t be the way that that change is going to take place. Without the textile industry in Bangladesh, many many more people would be without a job and without any income. Bangladesh depends in large on this industry for its exports. Should we boycott the country? Or should industry take responsibility and work together with (local) government and ngo’s to improve the labour circumstances on the ground, and thereby improve the quality of life of many people? An easy choice, when writing it down like that. But a difficult process to begin and to get going effectively. And, it can’t be down to industry alone. It also means that consumers have a responsibility to ask for better produced clothing. Unfortunately, that requires information: how does your favourite brand rank when it comes to labour, safety, health in its production locations? In the Netherlands there are a few resources available, which will hopefully be gaining in exposure. Some examples are Rankabrand and an app by Talking Dress to help you find brands that perform better on these issues. * UPDATE [5/5] – through a friend I just came across this article which discusses the Disney withdrawal in more detail. I still don’t believe that disengagement is the way forward. However, I can also understand the argument of lack of leverage (assuming Disney’s leverage is as non-existent as they seem to imply) for disengaging if that means you can allow more attention and effort in making sure other production locations are responsibly managed. Nevertheless, I do hope the choice for which country to leave from and in which country to stay was not just based on a Worldbank list as it should also depend on individual factories and local knowledge (available within the company, Disney in this case) – where circumstances may vary a lot locally. In only a short time from now I’ll be heading to Japan (mostly Tokyo) for a week or so for work. Yikes. That date is quickly getting closer. Which is great – I can’t wait – but this week I’ve also realized that it’s now really time to start filling up that week with appointments and meetings. I have a long list of people and organisations I would like to meet with. Many of which will not be a problem to meet with, but some of these people have no idea who I am. So it’s also important to get my story right when contacting them. Exciting – another step in establishing my own business. Why am I going to Tokyo? The trip has a few objectives, but mostly it is meant to further strengthen my professional network locally and to do some research on a few topics I’ve been working on. Mostly these are to get a better perspective on developments on sustainable urban development in Japan, and to find out more on CSR in Japan: what are the main topics in Japan for companies and what are currently the main challenges? To be continued, of course. And in the mean time, if anyone has further suggestions of relevant organisations/people to meet with who can help me with the above questions, I’d love to hear them!